Home » Floating Spoon Spotted On Mars? Floating Spoon Spotted On Mars? Of all the strange things people think they’ve seen in images of Mars — from crab monsters to pyramids — this might be the oddest one yet: a spoon that appears to be hovering just above the surface of the Red Planet. 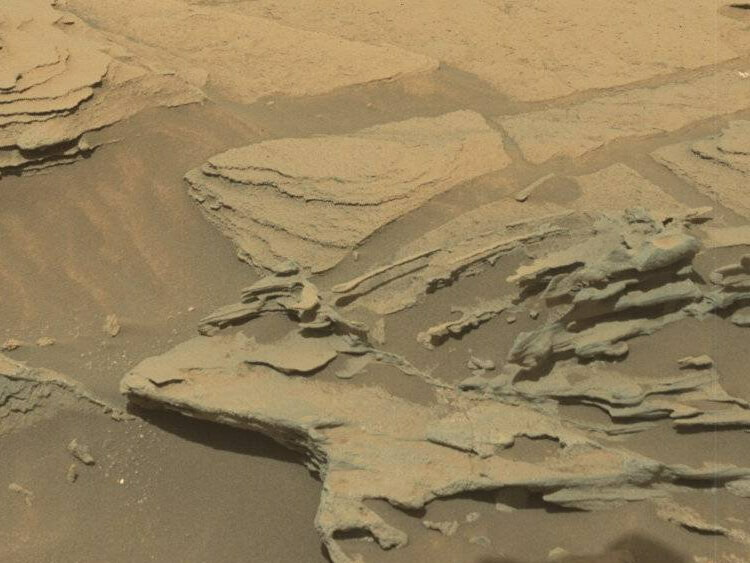 OK, it’s not really a spoon: it’s a bit of rock that has weathered out from the surrounding landscape, imaged by the Mars Curiosity rover. But the resemblance to a spoon is uncanny, both in the thinness of the “handle” and the bowl-like end. You can see it’s an actual outcrop by the shadow. This is no “woman on Mars“: it’s a real feature, not a shadow or a trick of the eye. A thin fragile rock feature like this wouldn’t survive long on Earth. Our atmosphere is much thicker and wetter: rain and other precipitation would erode a spoon like that away in a short time. Earth also has earthquakes and pesky organisms that interfere with delicate natural features, none of which Mars has. Of course, we don’t know how long this rock-spoon has been around, or how much longer it’ll survive. Mars has sandstorms and other abrasive weather, though they take longer to wear down rock than rain does. So whatever that bald kid from The Matrix says: there is a spoon. It’s just not gonna be much use for eating, much less for spoon-bending. But though it certainly looks spoon-like, it is, of course, not a spoon. It’s not actually floating, either, for that matter.